Are you looking to use hair extensions to add length, thickness, volume or color to your hair? XEX is Chicago’s premier hair extension salon specializing in fusion extensions. Your first step when getting fusion hair extensions is to set up a consultation with XEX. We require a consultation so we can determine if your hair is suitable for fusion extensions. If your hair isn’t compatible with fusion extensions, there are other options available like tape-in hair extensions or clip-in hair extensions. Once we’ve determined that your hair is suitable for extensions, we’ll order your hair and schedule your extensions application appointment. XEX uses 100% human hair for fusion extensions, providing the highest quality and finish. The application process for fusion hair extensions requires experience and skill. XEX’s hair extensions specialists will ensure that your fusion extensions are applied properly and look their best. Once the extensions are applied, your stylist will cut, blend and style your extensions as needed. How are the fusion extensions applied to my hair? We use a low heat application method to fuse the extensions to a very small section of your natural hair. A keratinized protein bond is used to help the extensions look and feel great. Can fusion hair extensions damage my natural hair? Fusion hair extensions rarely cause damage to natural hair, but there is always a slight risk. It is important to use an experienced and well-trained extensions specialist, like those at XEX, when getting fusion extensions. When damage does occur, it is usually because clients leave their extensions in too long or do not have a professional remove them. What hair type do fusion extensions work best with? Medium to thicker hair types typically work best for fusion hair extensions. We use only 100% human hair for fusion hair extensions. We work with reputable extensions suppliers to ensure that our Chicago hair extensions are of the highest quality. Our extensions come in over 85 colors, providing you with many options. Application time depends on your hair length, color and desired finish. 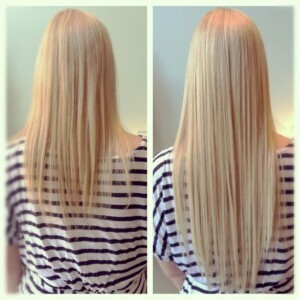 Typically, application of fusion extensions takes 3-5 hours. I have fine or thinning hair. Can I still get fusion hair extensions? We don’t recommend fusion hair extensions for fine or thinning hair. Certain types of fusion extensions may work though. If we’re able to accommodate your hair type, you may not be able to keep your fusion extensions in for longer than three months. Tape-in hair extensions or clip-in hair extensions may be more suitable for you if you have fine or thinning hair. If you want your hair color to be darker than the extensions that have been applied, we can color them. We cannot make extensions lighter though. Root touch ups and highlights to match your hair are definitely possible. Reuse of extensions is not possible. You must use new extensions with each application. Can I buy my own extensions and have XEX apply them? To ensure that we’re applying extensions that we know are of the highest quality, your extensions must be purchased through XEX. Yes, your XEX extensions specialist will inform you of the products you should use on your new extensions.